Members of the D. V. Skobeltsyn Institute of Nuclear Physics together with their colleagues from the Faculty of Chemistry of the Lomonosov Moscow State University have developed a new silicon- and germanium-based material that could significantly increase specific characteristics of lithium-ion batteries. The research results have been published in the Journal of Materials Chemistry A.
Lithium-ion batteries refer to the most popular type of energy storage systems, applied in modern electronic devices. Such batteries are composed of two electrodes – the negative (anode) and positive (cathode) ones, which are placed into a hermetic enclosure. The space in-between is filled with a porous separator, steeped in a lithium ion conductive electrolyte solution. The separator prevents short circuit between the bipolar electrodes and provides electrolyte volume, necessary for ion transport. Electric current in an external circuit is generated when lithium ions extract from the anode material and move through the electrolyte with further insertion into cathode material. However, specific capacity of a lithium-ion battery is largely defined by the number of lithium ions, which could be accepted and transfered by active materials both of the anode and cathode. The scientists have developed and studied a new anode material, which allows energy efficiency of Li-ion batteries to be significantly increased. The material is suitable for utilization in both bulk and thin film Li-ion batteries. Dr. Victor Krivchenko (PhD in Physics), a Senior Researcher at the Laboratory of Plasma Physics and Foundations of Micro-Technologies at the Department of Microelectronics at the D. V. Skobeltsyn Institute of Nuclear Physics, Lomonosov Moscow State University, and one of the article authors shares: " Much attention is currently given to elaboration of silicon (Si)- and germanium (Ge)-based anode materials. When interacting with lithium ions, these elements are capable of generating alloys, whose specific capacity, possible in theory, significantly exceeds the same one of graphite – the traditional anode material, used in modern lithium-ion batteries." Among all known anode materials, silicon possesses the highest lithium gravimetric capacity, possible in theory, achieving up to 4200 mAh/g. 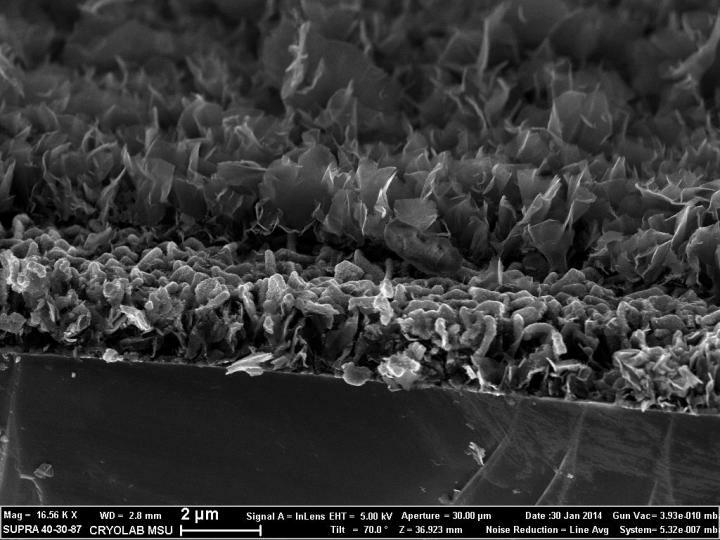 This makes it the most promising material for batteries with improved energy density. Germanium is more expensive and has less gravimetric capacity than silicon. However, it's better in conducting current. Moreover, lithium ion diffusion inside germanium is several orders of magnitude faster than inside silicon. Such germanium's peculiarities provide substantial increase of battery power density without significant alteration of their volume. The main problem of the electrode materials lies in the fact that their structure undergoes significantly degradation in the cyclic process of charging and discharging, resulting in battery failure. The scientists propose to solve this problem with the help of transition to nanostructured materials and development of composite materials, where various carbon nanostructures could be applied as stabilizing matrices. Transition from traditional two-dimensional to three-dimensional distribution of an active material on the electrode surface could be considered as an alternative solution. Victor Krivchenko continues: "The main novelty of the project is the idea to use a matrix, formed by plasma grown carbon structures with very complex surface architecture, for implementation of silicon- and germanium-based anode materials with desired structural and functional properties. Such structures are composed of dense array of graphene-like nanowalls, vertically oriented to the surface of a metallic substrate." The scientists have applied the magnetron sputtering technique, provided homogeneous coating of nanowall surfaces with 10-50 nm thick silicon or germanium layers. At the same time, the final structure of the composite anode could be composed of both one or alternating layers of active material. It was shown that the obtained three-dimensional architecture provides high specific capacity and increases stability of specific characteristics of silicon- and germanium-based anodes. The scientist concludes: "The research results could technologically underpin further elaboration of promising electrode materials for the next generation energy storage systems. In the framework of the project, the scientists have achieved world-class results in the area of novel nanostructured material application, along with elaborating and studying their electrochemical and physicochemical properties. The conducted researches have provided with new experimental data, contributing to the theoretical knowledge, relating to nanostructure behavior in electrochemical systems." The research has been conducted in tandem with the scientists from the Dubna University, L.N. Gumilyov Eurasian National University (Kazakhstan) and with technical support from the "Engineering Incubator", LLC specialists.